Parallel studies are focusing on characterizing early development of auditory function in crias utilizing the BAER. As congenital deafness in camelids appears to be due to premature degeneration of sensorineural structures early in life, it is important to know the normal maturation of hearing abilities in unaffected crias so that abnormal hearing during various stages of development can be recognized. To date, "normal" BAER recordings have been obtained in hearing crias as young as one day of age. Whether congenitally deaf crias are truly deaf at birth or have a delayed degeneration of auditory function after birth is not known. Further studies in this area should help define the developmental stage at which hearing abilities are lost in affected camelids. 6. More studies are in progress to determine onset and inheritance of congenital deafness in camelids. We are trying to determine mode of inheritance and determine genetic markers for this deafness trait, which is likely to be genetic. Research progress for congenital deafness is severely hindered by lack of funding. To date, all clinical research has been supported through the generous donations of private supporters such as: the Ohio River Valley Llama Association, A. L. Pacas Farms, the Camelid Health Foundation, and the Magical Farms Alpacas. 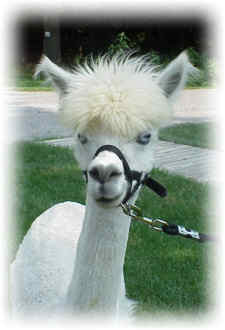 Alpaca owners throughout the United States, including Alaska generously donated animals used in breeding research! Without further funding, this report may be as far as we are able to go to further characterize this defect on your behalf. If you wish to support this research, please contact Dr. David Anderson at 614-292-6661 or Anderson.670@osu.edu.